Complex, multi-stakeholder initiatives get off track sometimes because people like to “throw red herrings” in meetings that only cause delays. 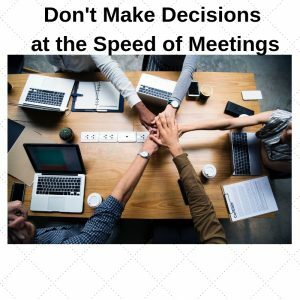 Let’s face it corporate America loves to have meetings but don’t make the mistake of making decisions at the speed of meetings. Below are three common decision “red herring” statements often purported in meetings that can simply be tactics to delay decision making. You have to have keen eyes, ears, sense of smell and courage to address these stinky fish in an effective way. Below are the common red herrings and what you can do about them. Indicates: Analysis paralysis and but more often there are certain people that always require more and more data. What You Can Do: Watch for who these people (executives are frequently the culprits here. Title doesn’t mean you should always get what you ask for.) Some more than others consistently ask for more data. The question to ask: Is this data/information request really necessary for actionable, critical decision making and which are just “curiosity” or feel good requests? Develop a set of general criteria that can be applied to requests made in the heat of the meeting in order to determine which requests are really needed around certain topics. Track the requests that do or don’t make sense over time and then let those people know how they rate in terms of the quality of their data requests. The IDG (Innovate the Daily Grind) Opportunity: Track data requests made in meetings, regardless of who makes the request, and create an objective way to capture and then communicate in a standard, repeatable way to the requesters — after the meeting — whether their request for data will be met and by whom. Indicates: A cultural lack of empowerment or poor communication mechanisms to engage people virtually outside of specific meetings. What You Can Do: Ensure that your company has a communication method and process for getting answers such that people who are not present can respond at later times or at any time of day. The IDG (Innovate the Daily Grind) Opportunity: Find a way (process and tool) to have 24/7 inclusive communications and decision making. In the heat of the meeting, this one indicates resource allocation decisions that are emotional and not logical. What You Can Do: When resource contention occurs, you should avoid trying to finalize this in the meeting but just note the resource details being requested. Discuss it later. In that later discussion, you should bring a bring a clear understanding and representation of your resource bandwidth, roles, and effectiveness and be able to produce this for decision-making purposes. The IDG (Innovate the Daily Grind) Opportunity: Find a way (process and tool) to have 24/7 communications and decision making related to resources. Stoke your fire and cook up those meeting red herrings so that the smell doesn’t distract everyone from making real progress. You need to innovate the daily grind to solve these annoying meeting habits and make decisions FASTER! This entry was posted in Decision Making by Amy Kelling. Bookmark the permalink.